Team Kamus + Keller had a great time supporting LACRA and The Weingart Center at the 20th Annual LACRA Bowling Tournament. 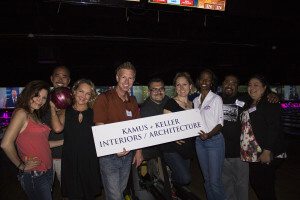 Held at the iconic Bay Shore Lanes in Santa Monica, CA on Saturday, November 8, our two Kamus + Keller teams held their own and displayed some mad bowling skills against some of the best in the industry. Internally however, The “Keller Crew” rolled over the “Bi Polar Rollers” for a healthy win. Congratulations “Keller Crew” players Marsial Seda (Team Captain), Paula Harris, Cory Anttila, and Jodi Anttila. Bi-Polar Rollers were represented by Aaron Nicholls (Team Captain), Jules Lucero, Kristen Mays and Nima Kharrazi. A big thank you to LACRA and the event sponsors for throwing such a fun event!